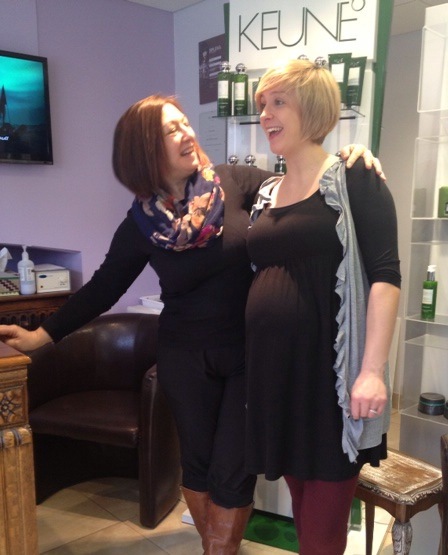 Hanna, our top stylist and colour expert is about to go on maternity leave. Exciting times! We wish her and husband Joe all the very best with the arrival of their first baby. We will keep you updated on this very special arrival! You have been a stylist for 6 years. What do you remember most about being a junior stylist? It has been a good few years and I have had some great clients. Unfortunately right at the beginning, I cut my finger on my brand new scissors while I was cutting a gents hair, it wouldn’t stop bleeding so I had to get one of the other girls to take over for me, embarrassing!! These days you are the colour expert for the salon. What does this mean for you clients and colleagues? I’ve been through some really intensive training to become a colour expert. I think clients enjoy having someone with my level of training and experience. I share what I know with the team who learn from the tips and tricks I’ve picked up along the way. What do you have to do to become a colour expert? I went to the Wella world Studio in London for 3 days every month for a year to complete my MCA (Master Colour Award). We had stages of practical and theory based lessons learning everything from what your hair is made up of, to how your eye perceives colour. And then there was the famous head block challenge which everyone talks about from day one. A head block with long hair split into 4 sections – one black, one green, one red with a dark stripe through it, and one blonde. The challenge: to change the hair all to the same colour in a 6 hour exam! Thank goodness I passed but it was pretty hard! And fortunately I havn’t had anyone come into the salon with a similar challenge… yet! What is the best thing about working with the other staff at Gill Goddard Hair? I love the fact that everyone who works here gets along. We are mates as well as being work colleagues. We can have a laugh together. I mean who wants to work with people they don’t like?! 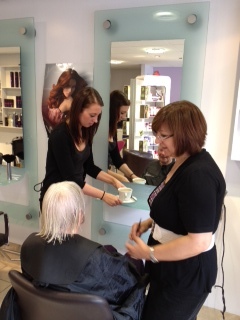 When have you seen the team in the salon at working at its very best? You help manage the salon and develop staff. 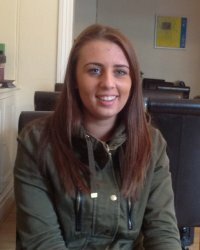 Why is training important in the salon more generally? I think our training is a great way of keeping up within our industry but also it is really good fun. When you do a job that you enjoy the training just makes you want to be even better at it! I prefer the colour training obviously but it’s great that Gill dedicates time out for us to learn and keep us on our toes!! Plus, it means our client have a positive experience with all the stylist – we are all motivated. How has it been maintaining a busy day job whilst being pregnant? It’s been fine. Clients are always asking me how I am feeling which is nice. I have been trying to sit down more often. Fern has been helping me blow-dry clients hair for a while now so that I’m not standing up all the time. As for cravings – I haven’t really had them. But I am loving hula hoops, whenever there’s a packet lying around in the salon the girls know they are mine! What will you miss whilst you are away on maternity leave do you think? It is hard to tell before I go, but I know I will miss having nice hair all the time! I’m hoping the girls won’t mind me popping in to keep up my roots and cut! For a start I’ll miss the lift to work and home – I’ll have to catch the bus. I’m having driving lessons though. Hopefully Hanna’s road rage wont have rubbed off on me, haha. Also just her support, she’s always there to help out. I’ve got a real buzz out of learning colour with Hanna. Also, just her support, she’s always there for me. One day I’d like to be a top stylist. Gonna be really strange without Han here, gonna miss her a lot. Since I started here 3 years ago I’ve looked up to her with everything and she’s helped and taught me so much! Her time off will fly by though cos we’re so busy and she’ll be back in no time, in the meanime we all get on so well and work well as a team. We will all get on with it and step up to make sure Hans gap is covered. Now she is leaving I thought I have got a break from doing her hair (most fussiest client ever.) But nope she has assured me she will be back just as much to get her hair done! Long hair just doesn’t look good without some styling in the form of layers, fringes or added products for volume and curls. It’s easy to wear it in a band or piled up on top. But you lose the look that you’ve spent so much time waiting for in growing your hair long. There are so many ways to wear it down. So if this is you, we can give you some really good styling and advice. Recently a client from long ago came back to the salon as, having grown her hair from her last hair cut three years ago, her hair looked gorgeous but lacked style. It also needed some professional attention to the ends and some shaping around the face. We decided not to blow dry after the cut was finished because I wanted to demonstrate how nice it could look naturally. I added Macadamia Curling Cream to her layered natural brunette curls, creating a lovely shining effect. (This product really works for unfrizzing long or short curls.) It looked amazing with a long sweeping fringe that could be straightened, curled or volumised with a hairbrush or rollers at home and I showed her how quickly she could do this herself. 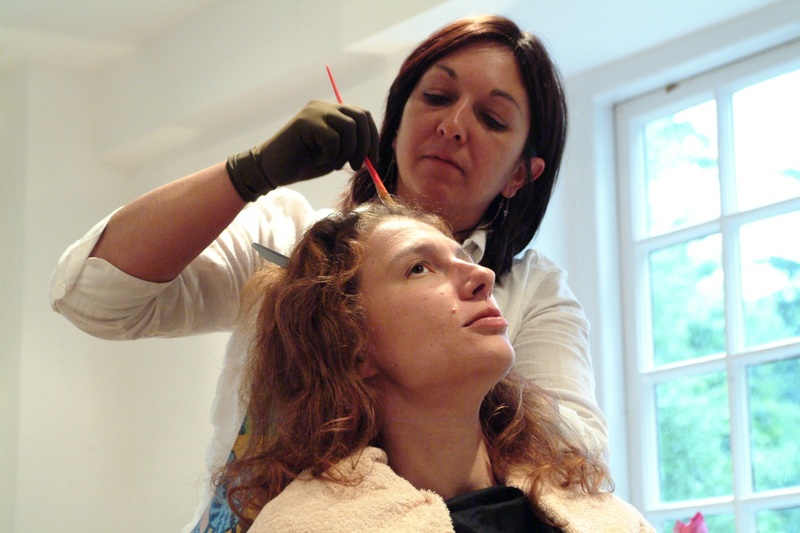 We always take time to assess your needs and after-care in the salon. Understanding your face shape, the texture of your hair and the demands your lifestyle places on your hair is important. Our main aim is always going to be to make our customers love and take pride in their hair. Beautiful hair contributes to a feeling of wellbeing. Suza Katz is relaxing with a colour treatment to enhance her auburn locks! So how can I make the most of a new style? Understanding your face shape is a part of the discussion about the style that will enhance your look. We can help you and advise you on all your options but knowing your hair type and your face shape are strong starting points. To discover your face shape at home, pin back or hold up all the hair from your face and look to see in the mirror whether you can identify an oval, square, heart-shaped or a round face. Then, check the space below your chin. Are you long in the neck or short? This will help to locate where to concentrate on volumising your hair. And therefore will help determine the cut, treatments and products that are right for you. Plus, we will take into account how you will style your hair at home so that you have a great finish everyday – not just the day you step out of the salon. We know, for example, that it is difficult to volumise the crown area of the head at home with a full fringe! How can I compliment the cut to make my long hair look its best? A combination of approaches can work really well. Depending on the style we might use a large round brush for blow-drying sections of hair, teamed with a root spray or just lift gently later on for more relaxed volume with our Salon Professional Flexible Hold Hairspray. Products can be very useful in adding volume to your hair. We recommend our products of the month, which lots of our customers swear by: Wella Volumising Shampoo and Leave- In- Volume Conditioner. The Wella Volumise Line is extremely effective at strengthening fine hair. These two products are light and particularly good at creating long-lasting volume for straight hair. Other hair types and textures benefit from a small amount of Macadamia Oil/spray or curl cream before blow-drying, with fantastic results. Colour can more than transform long hair: We can add soft tones and colours to lightly greying hair, giving a natural depth of colour that really suits you and gives a vibrant shine. We will always give home-care advice between treatments and are offering a special deal on long hair-up-do’s throughout March. What if my hair is damaged or difficult to manage? All our staff take pride in treating and transforming damaged and over-treated hair, and changing it into something beautiful. We offer the popular Keratin Smoothing Treatment for frizzy and unmanageable long hair. Adding an Alchemy Treatment to any style provides a luxury finish for many because it can add volume and another ingredient to repair, smoothen, hydrate or add shine to hair. Everyone with long hair is very aware of the time and commitment it has taken to grow their hair. Our commitment is to work in consultation with you so that we can achieve the best and healthiest results, together, for your hair. 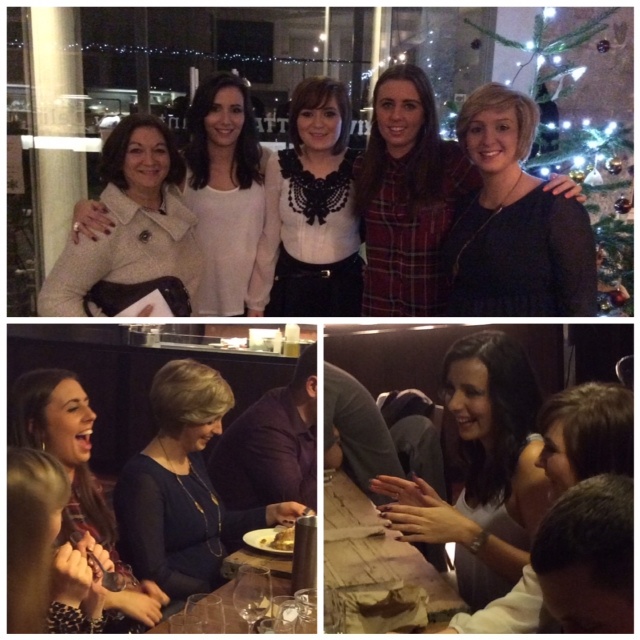 This is our fifth year at Gill Goddard Hair – time to celebrate. So firstly, a huge THANK YOU to all our customers. We are glad you are still enjoying fantastic styles and great service from our salon. For me, this is a good time to stop and reflect. It has been amazing, but what, personally, have been some of the characteristics of these past years? A true professional vibe exists in our salon. You can sense that as soon as you walk through the door. I can’t rate this too highly as it is makes that atmosphere constantly fresh and intriguing for our customers. To get this result I manage the team alongside running my own appointment book. This is demanding and sometimes can leave me exhausted. However, I appreciate that every day I train people who I have chosen for their potential, aptitude and ambition, quick wit and amazing dedication. They work long hours and have the utmost loyalty to me and our customers. And that really does result in the best customer serve. I know I provide leadership at the salon. I am able to make the right choices at difficult moments based on learning from past experience and from my amazing coach, who has been central to my stability and development as a leader. Part of being a great leader is maintaining high professional standards at all times despite having to deal with and resolve immediate issues. It is really challenging to have to deal with unreasonable and confrontational customers. However, I always have to take into account that they might be nervous or unsure due to poor quality experiences in other salons. As well as a commitment to work-life balance we have a dignity at work policy. This makes it clear to all staff the standard to which to treat all customers but also makes it clear what they should expect from customers in return. I love that I work, every day, in a creative environment that I designed. I thoroughly researched the business and set it up to be durable as an enterprise and an exciting and peaceful place for customers and staff. I think it continues to be that today. Despite fierce competition in Totnes we have a business to celebrate. Even trading through a recession we are still growing every year between 10 and 12 %. I am proud of the whole team. I have to set aside time to wash, condition and blow dry my hair every single day for work. I can never have a bad hair day. It is a metaphor for business: Everyone running a service knows what it is to get out of bed every day with the energy needed to meet and exceed your customers’ expectations (however under the weather you might feel from time to time). But I enjoy setting a standard, supporting my staff to deliver. I welcome every customer knowing that we offer them excellent customer service, brilliant hair now, and will for the next five years.